The University of Notre Dame is a private Catholic research university in South Bend, IN. Founded in 1842 by members of the Congregation of Holy Cross, Notre Dame has become one of the nation’s top religiously affiliated schools, combining excellent academics with the Catholic Tradition. Notre Dame always has been heavily residential, with about four in five undergraduate living on Campus. A Notre Dame education begins with 9 Schools and Colleges – School of Architecture, College of Arts and Letters, Graduate School, First Year of Studies, Mendoza College of Business, College of Engineering, College of Science, The Law School, Keough School of Global Affairs. The University has attracted more than 1200 scholars who are interested in teaching over 12000 students, who knew education is more than what is taught in classrooms and laboratories. Notre Dame is one of the colleges nationally that is committed to meeting the full demonstrated financial need of students. Meeting each student’s full demonstrated need allows Norte Dame to be more sensitive to a family’s individual situation and assist accomplished students from a wide range of backgrounds. The office of Financial Aid thoroughly reviews each student’s application on an individual basis. 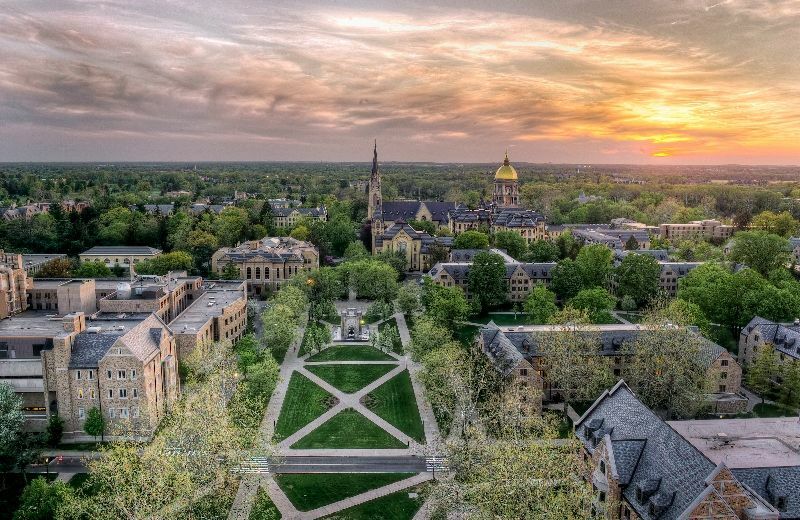 The University of Notre Dame enjoys extraordinary worldwide presence, a good portion of which is mediated through its network of Global Gateways. The current five Global Gateways – located in Beijing, Dublin, Jerusalem, London and Rome – provide academic and intellectual hubs where scholars, students and leaders from universities, government, business and community gather topical and enduring relevance. International students and scholars enhance campus diversity and cultural understanding. NDI works to support them in their transition to life in the US. The University is dedicated to the pursuit and sharing of truth for its own sake with all the forms of knowledge found in the arts, science, professions and every other area of human scholarship and creativity. Accounting is called the language of bussiness.The students acquire the ability to analyse ,communicate,and forecast the economic activities of bussines.Courses focuse on analytical and problem solving skills,within the context of financial reporting, managerial decision making and tax planning. "Aerospace Engineering has the ""Technical Specialization"" elective and the ""Professional Development"" elective. Mechanical Engineering has ""AME Technical Electives"" and ""General Technical Electives."" The definition for each is different and students must take care to ensure that they satisfy the different elective requirements in their program." The department of Africana studies of african american and the african diaspora- the global dispersion of peoples of african descent.The course focus on politice,theology,race,education and history related to africana world. Amercian studies focus on historical and intellectual underpinnings of the religion,culture,society.It offers interdisciplinery perspectives of american culture and societies,american identities and American political cultures and institutions. To add stature and credibilitiy to the major, a 6-credit Senior Thesis is offered, allowing exceptional students the opportunity to sharpen their critical abilities and improve their research techniques by developing a year-long project. The department of Anthropology is committed to a multidimensional inquiry into what it is to be human past and present, nearby and distant. Notre Dame s Anthropology program explores the richness and diversity of the discipline by building bridges between various humanistic and scientific approaches. We seek to involve faculty and students in integrative anthropology, including engagement with different anthropological and interdisciplinary perspectives, integration of theory and application, and integration of teaching, research, and ethics. The annual cost of living at University of Notre Dame is $14,500 approx.